Buckingham County: Banjo Country | slate river ramblings . . . . It should not come as a surprise that the banjo was a favorite instrument in Buckingham County. 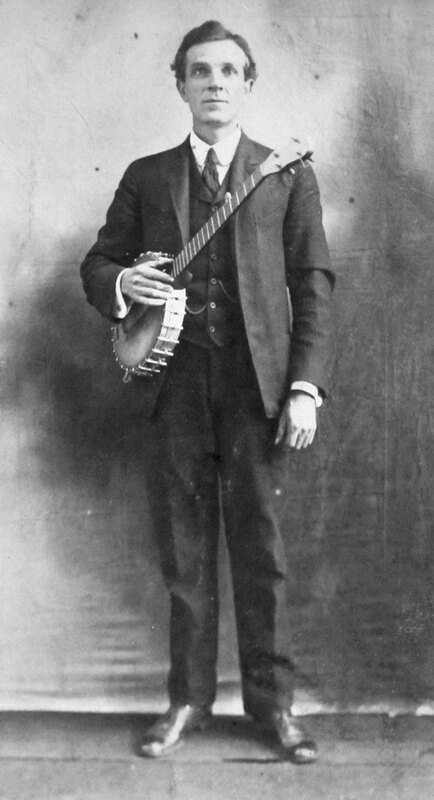 Pictured above is Marshall Perkins Claiborne (12 March 1873–19 August 1939), accompanied by his beloved banjo. He was not a professional musician. In 1930, he was in the lumber business. His wife was Aubra Gordon Price (21 April 1890–14 May 1966). Claiborne was born in Buckingham, his parents were Serg’t Temple Irving Claiborne, C.S.A. and Martha Elizabeth “Patty” Scruggs, both of the county. His Buckingham pedigree was a long one, stretching back to his great-grandfather, Leonard Cliborn, who lived on land adjoining Whispering Creek and bordering the Bolling family at Chellowe. Leonard Cliborn fought in the Revolutionary War, came to Buckingham from Chesterfield County in 1809, and married Frances “Fanny” Tanner of Amelia County. Marshall’s grandparents were Thomas O. Claiborne and Laura A. Garnett of Cold Comfort, Gravel Hill. For more about the Claiborne family in Buckingham County, just type “Claiborne” in the search box at Slate River Ramblings. Ted, his photo is charming and very dignified. I can hear the banjo playing ….